In the Translation Unit we will extend our knowledge on Topic 2.7 DNA Replication, Transcription and Translation. Information transferred from DNA to mRNA is translated into an amino acid sequence. Outline the process of translation elongation, including codon recognition, bond formation and translocation. 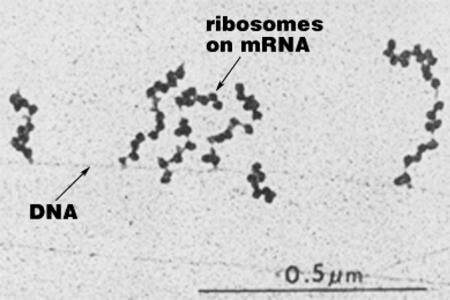 State the direction of movement of the ribosome along the mRNA molecule. While the first tRNA is still attached, a second tRNA attaches to the mRNA at the A site on the ribosome, carrying the amino acid that corresponds to the mRNA codon. The methionine amino acid at the P site binds to the amino acid carried by the second tRNA located at the A site. The two amino acids are joined together through a condensation reaction that creates a peptide bond between the two amino acids. The ribosome moves along the mRNA one codon shifting the tRNA that was attached to methionine to the E site. The tRNA is released back into the cytoplasm from the E site, allowing it to pick up another amino acid (methionine) to build another polypeptide. Another tRNA moves into the empty A site bringing the next amino acid corresponding to the mRNA codon. Again, the amino acid is attached to the polypeptide forming a peptide bond, the ribosome slides across one codon and tRNA at the P site moves into the E site releasing it back into the cytoplasm. 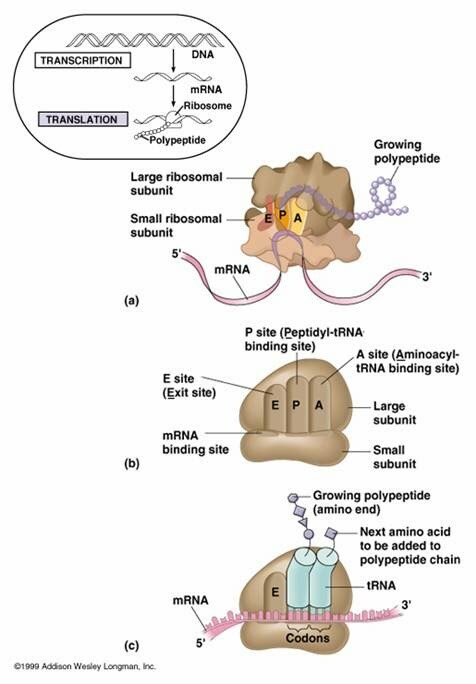 The ribosome continues to move along the mRNA adding amino acids to the polypeptide chain. This process continues until a stop codon is reached. State the difference between free and bound ribosomes. List destinations of proteins synthesized on free ribosomes. Ribosomes are composed of rRNA and protein. ​Free ribosomes are located in the cytoplasm, and the bound ribosomes are attached to the endoplasmic reticulum. Free ribosomes produce proteins for the cell, while bound ribosomes produce proteins that are transported out of the cell. Free ribosomes in the cytoplasm synthesize proteins that will be used inside the cell in the cytoplasm, mitochondria and chloroplasts (in autotrophs). List destinations of proteins synthesized on bound ribosomes. Outline how a ribosome becomes bound to the endoplasmic reticulum. Ribosomes attached to ER create proteins that are secreted from the cell by exocytosis or are used in lysosomes. 7.3 U 7 ​The sequence and number of amino acids in the polypeptide is the primary structure. (Oxford Biology Course Companion page 366). Describe the secondary structure of a protein, including the type of bonding involved. 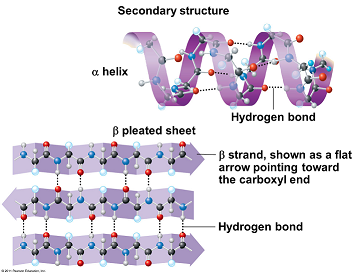 Identify the alpha-helix and beta-pleated sheet in images of protein structure. Secondary structure is created when the hydrogen bonds are formed between the main peptide groups in amino acids (not the R groups) in the polypeptide. The two main structures formed are the alpha helix and the beta pleated sheets which are locally defined, which means there can be many different secondary structures present in a single protein molecule. Proteins with secondary structure are generally structural in nature like the secondary structure in silk. 7.3 U 9 ​The tertiary structure is the further folding of the polypeptide stabilized by interactions between R groups. Describe the tertiary structure of a protein, including the types of R group interactions involved. Explain how the chemical characteristics of R groups in the polypeptide chain affect protein folding. Tertiary structure is the third level of protein organization. Tertiary structure develops a three dimensional shape because of the interactions that occur between the R groups. Disulphide bridges form between sulphur atoms on the R-groups from the amino acid cysteine. Hydrogen bonds form between polar R-groups and other polar R-groups. Hydrophobic R-groups turn inwards away from water and hydrophilic R-groups face outwards towards the water. Protein is globular in nature. 7.3 U 10 ​The quaternary structure exists in proteins with more than one polypeptide chain. Outline the quaternary structure of protein folding. Describe the structure of a conjugated protein, including the prosthetic group. 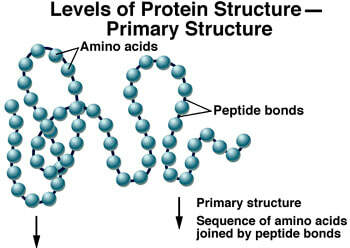 Protein consisting of more than one polypeptide chain. These chains can consist of quaternary structures. Quaternary structure exists in many proteins such as hemoglobin (4 polypeptide chains). Hemoglobin also contains a prosthetic group (non-polypeptide structure). The prosthetic group in hemoglobin is iron. Hemoglobin contains 4 iron molecules. State the role of the tRNA activating enzymes. Outline the process of attaching an amino acid to tRNA by the tRNA activating enzyme. Each tRNA binds with a specific amino acid in the cytoplasm in a reaction catalyzed by a specific tRNA-activating enzyme (21 specific enzymes for the 21 different amino acids). Each specific amino acid binds covalently to the 3'- terminal nucleotide (CCA) at the end of the tRNA molecule. 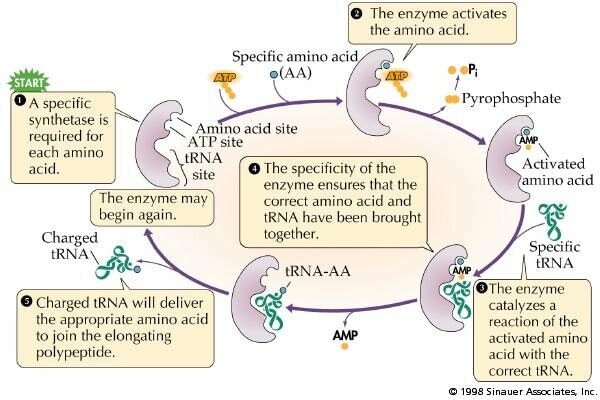 The binding of the specific amino acid to the tRNA requires energy from ATP. 7.3.S1 The use of molecular visualization software to analyze the structure of eukaryotic ribosomes and tRNA molecules (Oxford Biology Course Companion page 362). Describe the structure of the ribosomes, including the small and large subunits and the names and roles of the tRNA binding sites. Use molecular visualization software to view and identify the small and large subunit and tRNA binding sites of the ribosome. Outline the structure of tRNA molecules. Use molecular visualization software to view and identify the anticodon and amino acid binding site of a tRNA. Ribosomes are organelles made from protein and RNA that catalyze the assembly of amino acids into polypeptides during translation. 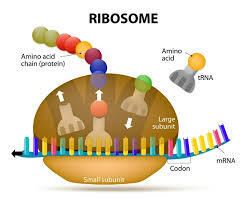 Ribosomes consist of two subunits; a large subunit and a small sub unit. The large sub-unit consists of 3 binding sites for tRNA molecules called the A site (The A site binds an aminoacyl-tRNA (tRNA bound to an amino acid); the P site binds a peptidyl-tRNA (tRNA bound to the peptide being synthesized); and the E site binds a free tRNA (no amino acid attached) before it exits the ribosome. The order of the sites in the ribosomes is E P A. There is a binding site for the mRNA on the surface of the ribosome The small subunit of the ribosome contains the binding site for the mRNA strand. The space between the two subunits of the ribosome is where the polypeptide is assembled during translation. Outline the structure of a polysome. Identify the beginning of an mRNA strand in a micrograph of polysomes. 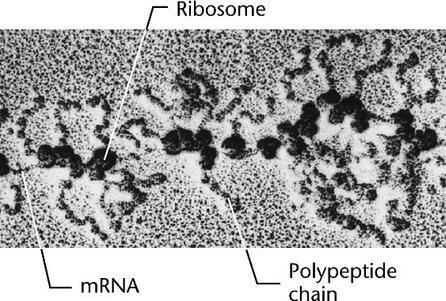 Polysomes are several ribosomes used to translate an mRNA at the same time, forming what is called a polysome. More than one ribosome can translate an mRNA at one time, making it possible to produce many polypeptides simultaneously from a single mRNA. ​​​Correct use of terminology is a key skill in Biology. It is essential to use key terms correctly when communicating your understanding, particularly in assessments. Use the quizlet flashcards or other tools such as learn, scatter, space race, speller and test to help you master the vocabulary. Translation process for protein synthesis. ​Everyone has heard of proteins. What are they on the molecular level? They're polymers of amino acids, of course. They make up most of your body, so we have to understand their structure very well! 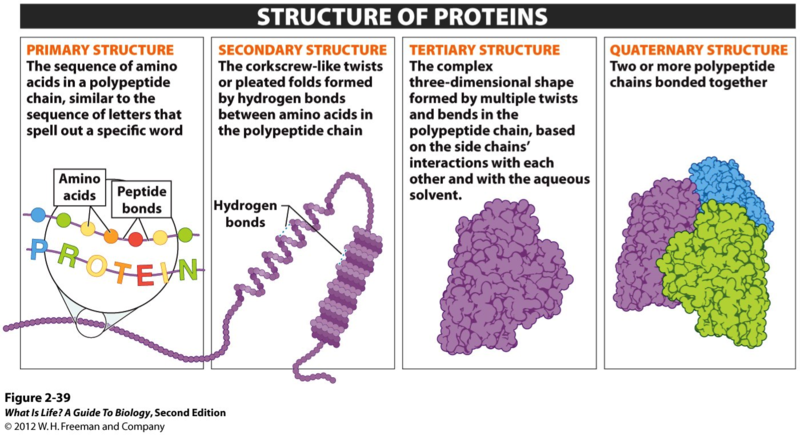 Check this out to learn the hierarchy of protein structure so that we can later learn all about what different types of proteins can do. Contributions to The Amazing World of Science is licensed under a Creative Commons Attribution-ShareAlike 4.0 International License.